Daniel, in a brief interview, pointed out that over the 60 years that UWI has been in existence, it continues to be known for giving quality education and offering a good mix of programmes such as the humanities, sciences, education and law. Daniel highlighted that a test of the quality of its students can also be found in the calibre of persons who have graduated from the institution, such as regional leaders. He said that the UWI Open Campus will continue to conduct visits to secondary schools throughout the country as part of its promotional drive at encouraging the pupils to make UWI their university of first choice. 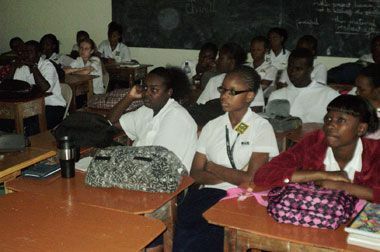 He noted that in October to November last year, a number of schools were visited, and throughout February to March this year, schools such as the Buccament Bay Secondary, Thomas Saunders Secondary, St Vincent Grammar School, St Clair Dacon Secondary, Adelphi Secondary, Emmanuel High School Mespo, Mountain View Adventist Academy and Dr J.P. Eustace Memorial will be visited.